Description: Astrophytum ornatum (a.k.a. Ornamented Bishop's Cap ) is a shortly columnar cactus appearing star-shaped from above, with white cross bands of woolly scales less than pinhead-sized. 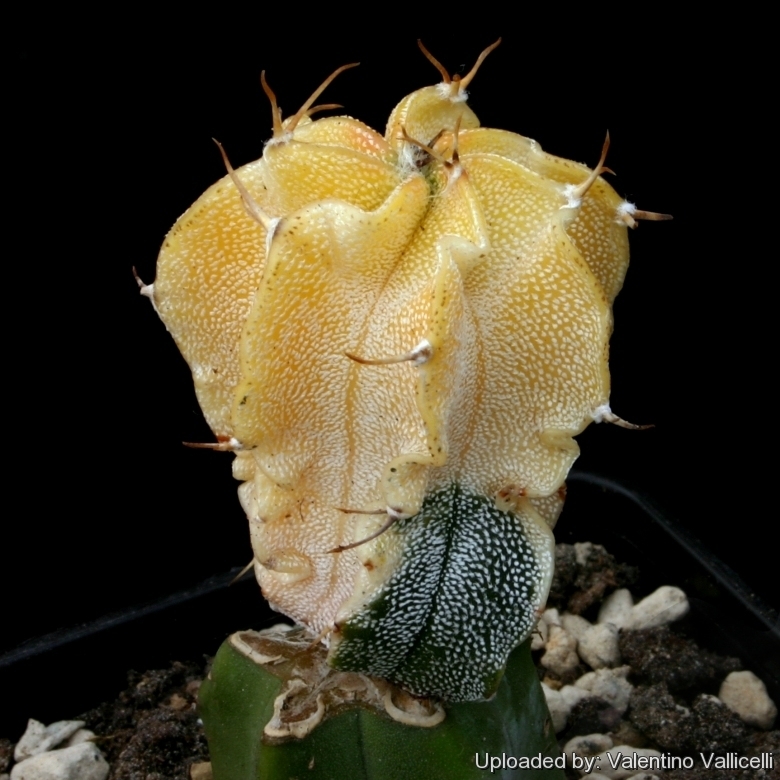 Forma aurea or aurata (yellow form): The schizochromic form (Astrophytum ornatum f. aurea) has pale yellow stems due to the absence (or reduced production) of chlorophyll pigments: every other pigment is present at normal levels, the dominant green colouration is lost, but will still more than likely have normal other pigments that give the yellow overall appearance of the stem. This form with yellow stems is very attractive and highly prized. This schizochromic form is almost always seen grafted on stronger columnar species, and cannot can be grown on its own roots. However some clones have enough chlorophyll in their tissues and can be grown on they own roots too, but very slow growing. Stem: The stem is solitary, globose when young, cylindric with age, but much smaller and thinner than the standard green form and rarely more than 10 cm tall, pale to dark yellow, with more or less dense white woolly flakes in bands forming an ornate pattern. Ribs: It has 5 to 10 (generally 8) straight or frequently spiralling, rather prominent, strongly compressed, more or less sinuate and crenate . Areoles: 1 to 2 cm apart, at first yellowish-white felted, later grabrescent. Radial spines: 5-11 , up to 2 cm long usually straight, subulated or ± laterally compressed, amber yellow, later brown and finally grey. Flowers: At apex, large, lemon-yellow 7-12 cm broad, inner perianth segments broadly oblong, with a broad, more or less serrated apex, tube short woolly, scale on ovary, dark and very narrow. Albinism: Every once in a while a plant exhibits albinism (completely lacking chlorophyll pigment). This means that its tissue is unable to carry out photosynthesis. The result is a completely cream-white plant. This plant will be weaker than a green plant, and albinism is generally a fatal trait (it can't produce its own food and it's not getting it from anywhere else). Without chlorophyll, the albino plant has no way to manufacture the food needed for survival and growth to maturity. This implies that these plants cannot survive on their own roots, and necessitate being grafted on a normal green plant that provides food. Some of these albino plants are indeed very popular, and sought after by collectors.